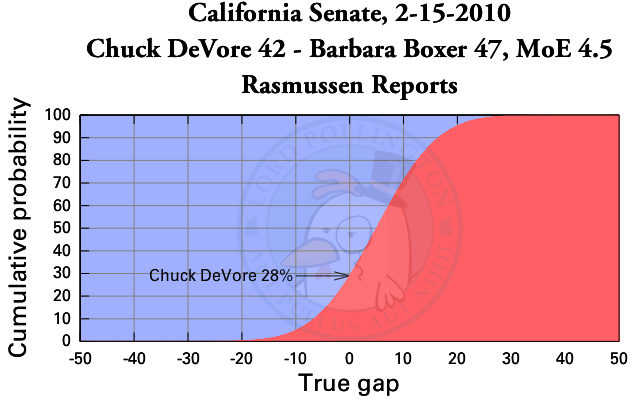 The poll itself says Boxer 47%, DeVore 42% with a margin of error of 4.5%. My analysis using my initial model – which is a simple, but hopefully effective, use of normal distributions combined with a pretense of independence – gives DeVore a 28% chance of victory were the election held that day, according to that poll. For a Republican in California, a better than one in four shot is rather good. Considering Republicans have lost every Senate election in this state since Pete Wilson stepped down to become Governor, 28% is a big upgrade. Is that too optimistic? I think not. Traditionally an incumbent Senator is said to fall into trouble when falling below 50% in the polls. Boxer at 47% is in the traditional danger zone, so the fact that my model gives her challenger a real chance to win is not unreasonable. Do we trust Rasmussen? His polling depends heavily on his model of likely voters, which to my eye seems more specific than that of some other pollsters. If he’s overshooting or undershooting either Democrat discontentment or TEA party energy, this could be way off. But my analysis is not designed to determine this. My single-poll analyses attempt to unpack what a given poll says. Whether we then trust what that poll says is a separate question, one I will later address when aggregating different polls. That number is also expected to change as the months pass, as well. A poll is not a predictor; it is a snapshot. Will DeVore’s chances go up or down as his name recogntion grows among independents and Democrats? Will Boxer’s support fall as she continues to commit gaffes such as her “call me Senator” request, and as Democrats grow disaffected with the failure of Washington Democrats to pass promised bills? That is where poll analysis ends and other forms of analysis begin. My goal here is to give a good start with the poll, no more, no less. We all can play armchair pundit from there.